Was James, the Brother of the Lord, Among the Twelve Apostles? Question: "I read recently that James, the “brother of the Lord," was not one of the 12 Apostles. Are there not two James’ among the twelve? Please elaborate and clarify the identity of these 3 (or 2?) individuals?" 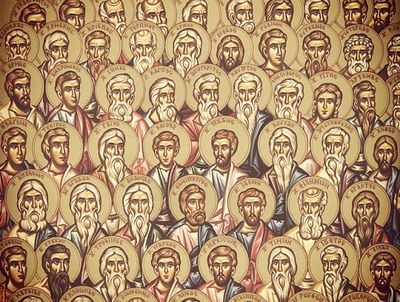 Among the the twelve Apostles, there are two with the name of James. "James" is the English form of the name "Iakovos," in the Greek New Testament, which is the Greek form of the Hebrew name "Yakov", or "Jacob". This being the name of the Father of the Israelites, it was a very common name among Jews during the the time of Christ's earthly ministry. In the lists of the twelve Apostles, we find "James, the son of Zebedee"; and "James, the son of Alphaeus." We also find references to a "James, the less," and of course "James, the Lord's Brother." 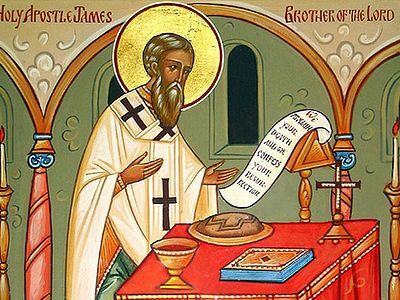 We know that St. James the brother of the Lord could not be identified with James, the son of Zebedee, because he (the son of Zebedee) was the first Apostle to be martyred, and St. James, the brother of the Lord was Martyred not long before the destruction of Jerusalem, according to Josephus. As we have discussed previously, there is a good case that the brothers of the Lord were the sons of Cleopas, St. Joseph's brother. And James the less is likely the son of Mary, the wife of Cleopas. Roman Catholic scholars have tended to identify James the son of Alphaeus with the brother of the Lord, and many have argued that "Alphaeus" and "Cleopas" are two variations in Greek of the Aramaic name "Kalphi" -- and so if this is true, St. James the Brother of the Lord would be numbered among the twelve Apostles, and would be the same as James the less. Many object to this possibility based on the fact that the Gospels speak of the brothers of the Lord being in opposition to Christ's ministry. However, the fact that many of the Lord's kinsmen may have opposed Him prior to the Resurrection, does not prove that all of them did. The Tradition of the Church holds that St. James, the brother of the Lord, always supported Christ. It is also true, however, that the most common tradition in the Orthodox Church would not identify the brother of the Lord with James, the son of Alphaeus, nor would it count him among the twelve Apostles, though he is counted among the 70 Apostles. But there is no doubt at all that St. James, the brother of the Lord, was a central figure in the early Church. He was the first of the Apostles that the Lord appeared to after His Resurrection (1 Corinthians 15:7); he presided over the Council of Jerusalem, in Acts 15; and he was spoken of as being among the chief apostles (Galatians 1:19; Galatians 2:9). So whether he was one of the twelve or not, he occupied a very unique place in the early Church, and was more prominent than most of those who certainly were numbered among the twelve. The Synaxis of the Seventy Apostles was established by the Orthodox Church to indicate the equal honor of each of the Seventy. They were sent two by two by the Lord Jesus Christ to go before Him into the cities He would visit (Luke 10:1). 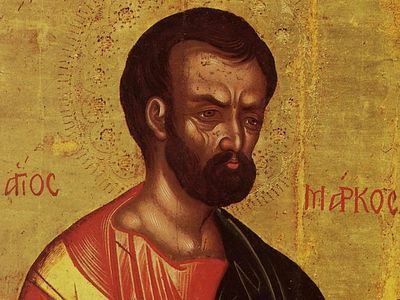 Did St. Mark "Blunder"? Fr. John Whiteford Did St. Mark "Blunder"? First of all, what does the word “brethren” mean? In the Bible it can signify various degrees of relation: blood brother, half-brother, or cousin. Some Protestant Bible scholars consider that after giving birth to Jesus, Mary had children by Joseph, and it is these children who are mentioned here.